In 1892, Captain Joshua Slocum, having retired, received as a gift, or I should say, a joke from Capt. Eben Pierce, a “ship” which proved to be a very antiquated sloop in Fairhaven, CT, that the neighbours had said must have been built “in the year 1.” She was on the hard, meaning ashore, propped up on stands, miles from sea and people thought that the only thing this ship was good for was to be broken up into fire wood. Capt. Slocum felled his first oak-tree a month later and began refitting her. Thirteen months later, at a cost of $533.62, Capt. Slocum had refit that little ship from the keel to the topmast, and it became the world renowned “Spray” and was the first to circumnavigate the globe single handedly. Joshua Slocum’s “Sailing Alone Around the World” has since become one of the greatest adventure stories of all time. No one thought he could do it, and most didn’t believe that he was doing it when he pulled into their ports. He took a year and a month to rebuild his sloop from the keel up, and got a boat that lasted him almost 20 years. He disappeared forever in December, 1906 on board the Spray while en route the Caribbean. The story of Slocum’s adventure stirs the hearts of many to this day, and is one of my greatest motivations as a sailor. However, there is a great lesson to be learned from this. If you want to do something, there is truly no one save yourself that can stop you. He let no one get in his way, or dampen his spirits. Many told him their opinions of how the ship should be refit, and many balked at his methods and designs. But he was not only successful, but became world famous as the first person to prove that a single man can circumnavigate the world. Now, in December of 2006, exactly one hundred years since Joshua Slocum set sail for the Caribbees, never to be seen again, his spirit is found in the refit of the Schooner Wanderer. 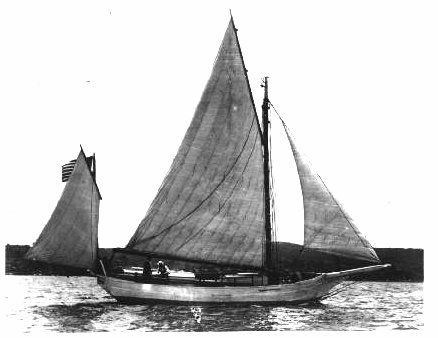 She is a topmast Schooner, of a 1903 Grand Banks design. Hand built by master shipwright Henry Thomas Vokey in Trinity Bay, Newfoundland in 1985, the Wanderer was his last and greatest tall ship project. The Wanderer is the ships second name, her first name was given to her by Vokey; “J & B” after his four daughters, Jane, Josephine, Beatrice and Bonnie. The Wanderer has seen some rough seas, having been a tourist attraction charter craft for 21 years, and if she were less of a ship, she wouldn’t be afloat today. She was dismasted by a shrimp boat in Georgia in October of 2006, and she now sits, dejectedly at anchor in Jekyll Island, GA, where many of the locals look upon her as the locals of Fairhaven looked upon the Spray. No masts, rotting bulwarks and cabin trunks, and the modern disease of epoxy covering areas of rotting wood that should have long ago been replaced. She’s been more engine than sails for five years, after her former master installed a gigantic Caterpillar engine to be able to power the boat with tourists aboard even if he was sailing against the wind. He never replaced the original sails, only kept them patched, “because it looked piraty.” Now, I seek to do to the Wanderer, what Capt. Slocum did to the Spray. What nobody thought he could do with that little ship, he did, and her name is famous to this day. While Slocum was the last great sailor of the first golden age of sail, I seek to carry the Wanderer into the third golden age of sail. By 1892, sail-based commerce was on its last legs. Slocum commented; “...for I had already found that I could not obtain work in a shipyard without first paying fifty dollars to a society, and as for a ship to command – there were not enough vessels to go around. Nearly all our tall vessels had been cut down for coal-barges, and were being ignominiously towed by the nose from port to port.” Today, the only tall ships still sailing, are doing so for historical preservation and eduactional purposes only. There are no tall ships plying the seas bearing freight, mail, or passengers in transit rather than on vacation. Sailing is arguably mankind’s oldest way of life, and dates back to prehistoric times. Everything we have ever achieved in this fascinating modern age we live in has been a result of sailing. Undiscovered countries charted out and inhabited. Freedom fought for and won. Regular trade routes established, and trade relationships fomented on the quarterdecks of some of the greatest examples of human achievement ever recorded. I think of Joshua Slocum’s undertaking in the Spray every time I stand on the quarterdeck of the Wanderer. I dedicate this restoration project to the legacy and spirit of Joshua Slocum. He undertook the impossible, and sailed it around the world by himself. The undertaking of the Wanderer is by no means a one man operation, however, she, like the Spray, is but one small boat on a great sea. What I wish to achieve with the Wanderer is to put some wind, as it were, into the sailing world once again. After languishing in luxuriant decadence for 60 years, the rich have thrown away sailing as quickly as they throw away all other pastimes when they are no longer a symbol of great status. The world moves too quickly for sailing, and people have lost interest in this purest and noblest of human endeavours. The world is moving too quickly for its inhabitants. As we run out of our precious resources, which we have become so dependant on, that in four short generations we have forgotten where we came from almost altogether. Not only are people not sailing anymore, except for a brave few who buck the system, like myself, but they are not gardening, not building their own homes, not fixing things and making do, but throwing them away when they get upon them, the smallest speck of dirt or wear. I firmly believe that if mankind is to survive another four generations and beyond, we are going to have to look back at where we came from to be able to move forward. The world is fighting wars over the resources we use to transport goods across the seas and around our respective countries. When we were still under sail, we didn’t fight wars for the cloth the sails were cut from. Wars were bitter to be sure, but they weren’t for money as much then, as they are today. We are running out of these resources, and are facing the bitterest war of all in our lifetimes. The answer to the dilemma of mankind lies in the seas, under sail. While we are furtively trying to invent new technology to solve the energy and transport crises emerging daily, the answer is sitting dejectedly at anchor, in Jekyll Island, GA, in need of love and attention. In need of people like Joshua Slocum who see not chores, but challenges. Not impossibilities, but successes. Not falling apart old seabirds, but diamonds in the rough. Not a lot of work, but a finished product before the project has even begun. I ask you, ladies and gentlemen, are you a Josh Slocum?